1. Put the written word ON somewhere in the room where everyone can see it. thing to sit on. Use a bench or a strong box if there are no stools.) Sing a song. Where is it easier to sing? (Sitting) on the chair or (standing) on the stool? Yes, ON the stool, because there you stand up. ON the lap of ______? Guess beforehand how many kids will fit. For example, two ON one leg and three ON the other. That will total five kids. Let the people count for themselves in their own language. 4. ‘Can you keep this blue ball ON your lap?’ ‘And ON the table?’ Which is more difficult? Why? The ball is round! Let everyone feel the ball. 5. Have the whole group describe 5 ordinary objects (for example, bucket, chair, box, paper, pencil). Divide into smaller groups of 4-6. For a very small class, divide into pairs of parents and children. Give each group the same items. Which group can build the highest tower using these objects? +Name the objects in the children’s mother tongue. Begin each time with the same song; that gives structure and recognition. Have this part last only as long as the youngest children can concentrate. This means that you might have only 7 minutes for the story. Read from a picture book. If none is available in the children’s mother tongue, invite a parent to retell the story in their own language. OR invite someone from the children’s community to tell an appropriate story. Screen the story first. 6. Needed: paper, pencils or crayons. Draw an object with something ON it (example: head with a hat ON it, branch with a bird ON it, chair with a child ON it) Talk about it while they work on it. When they have finished with one paper they may take another one. Write their names on the paper. Everyone may explain their own drawing in their mother language. Closing: Everyone sits in the circle ON their chair to sing the closing song. Put something in front of the door ON which the children can not stand or walk. Everyone walks nicely around it when they go outside. correct breathing (use of lungs, breathing from the diaphragm or abdomen) will result in a better voice. Explain that they are hiding it IN their hands. Let everyone say two things about the object in their hands (for example: its color, what it feels like, what is it made of, what it might be used for, where it came from). Try to guess what each person is holding. The parents and children may use their own language to do this. 2. Needed: box, each side painted a different color or covered with different color of paper; box has a hole in bottom so you can put your hand into a handpuppet inside the box; hand puppet inside box. Explain that the puppet is IN the box. The puppet will only come OUT once the children have named each of the colors on the box. Have the children name them first in their own language, then in the national language. 3. What’s in the box. Needed: Small box with an object in it. outloud what they see IN it. Puppet: What a nice box we have here. Do you know what is in it? Puppet: Don’t tell me! Let me guess! Is it as big as this chair? Puppet: Can you eat it? (etc., until the puppet has guessed what the object is). 4. Everyone draws an object IN which you can put something or someone (house, bucket, box, cage, car). However, do not draw anything IN it yet. Once that drawing is finished, pass it on to someone else. Everyone gets another piece of paper to make a second drawing. 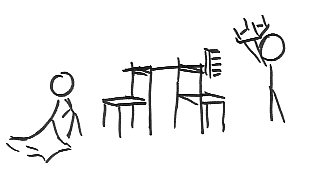 This time, draw what could be put IN the object on the first drawing (possible examples: car–people, cage–animal, house–chair, bucket–water, box–frog). 5. Mix up all the drawings. Have a child hold up the first two in the pile. Ask the class whether the thing in one drawing could go IN the thing on the other drawing. Make this a fun game. Silly “matches” are encouraged! table . . . ). Children should be able to go IN the hut. 7. Something to try: can you hold your thumb IN your hand? Closing: Before going outdoors the children get a sweet or some other small treat to eat. They have to put it IN their mouths. This teaches: When you hold an object in your hand, it makes it easier to remember the name of the object. Finding words to describe an object helps build the child’s vocabulary. This also helps the child to think about how to share meaning with someone else. They have to think about what the most important characteristics of the object are. They also have to speak clearly. They have to read the look on other people’s faces to see whether their own description was clear. This teaches: use your senses while learning to write; practice hand and finger movements which are used in writing; drawing shapes also used in writing is another good way to practice. 1. Sing a song. Point out that the voice goes UP and DOWN while you sing. Hum a tune going up and down. Move your finger up and down like a wave as notes in the tune go up and down. 2. Drop a cloth on the floor. Point out how the wrinkles in the cloth go UP and DOWN. Ask for a volunteer to lay it out smoothly. 3. Ask how a snake moves. Talk about how a snake slithers in a wave motion. Ask who can make those beautiful waves with their hands. Practice having hands and arms move like a snake. As always, check ahead of time that these motions and activities are culturally appropriate. Needed: bread dough, cookie dough, or clay. Everyone gets a piece of dough. Show how to roll the dough into a long, thin log. Show how to make wave patterns out of the roll of dough. Put it on a baking tray to bake at home or to let dry and harden until next lesson. Needed: piece of string or yarn; paper; glue. Give everyone a piece of string. Have them lay it on the shave of waves on the paper. Glue it down. Carefully feel the wave shape with a finger. If desired, glue the waves from one side of the paper to the other. Draw fish or other sea creatures below the wave shape and boats above it.Put it into the shape of a waves onto the paper and glue it. Follow the string with your finger and feel it carefully. Needed: paper and something to draw with. Make patterns of waves on the paper. Then have everyone turn the wave into a drawing (a snake, water, flag, cloth). Work in groups of two. One person “draws” on their partner’s back with their finger. The other person guesses what the pattern is. Closing: The group makes a long line by holding hands or by putting their hands on each other’s shoulders. The line moves in a waving pattern around the room and then goes outside. NOTE: may also pretend this is a sidewalk, a path, a rug . . ..
2. Have enough strings for everyone. (Ribbons, shoe laces, or yarn may also be used.) Show how a string can make a straight line if you pull on each end. Give everyone a string. Ask this question: When you straighten the strings and put them one after another so that they form a long line, how far will they go? From the table to the door (for example)? Try it out. 3. Divide the class into groups of four. Give everyone has a string. Have the people in each group stand in order—from the person with the longest string to the person with the shortest string. Ask the students how they might measure the length of their strings. Then have everyone stretch his or her string out into a straight line in front of him/her so that everyone else can see it. 4. Ask everyone to draw a house or other building. Which lines are straight ones? Then ask everyone to draw a tree. Does it have any straight lines? If so, which ones? *Which letters have straight lines? H, i, l, v. Other letters have a straight line as well. R, n, p. Write the letters with straight lines on the board or have students write them on their papers. Closing: Have the class stand in four straight lines. At a certain signal, they may go outside, but they must keep walking in a straight line. 1. Give everyone a string (ribbons, shoe laces, or yarn may also be used.) Tell them to tie it AROUND their wrist. May also have everyone hold a pencil in one hand and move the pencil around their other hand to the beat of a song. Do this as long as the song lasts. 3. Talk about a mosquito flying AROUND your head. Make mosquito noises. Choose a partner. Have your partner make the mosquito sound, too, but at a slightly higher or lower pitch. Have the group listen. Do the mosquitoes harmonize? Or not? Then have 3-7 members of the group stand in front of the others. Have everyone else close their eyes. Secretly choose several members the group standing in front to be mosquitoes. Once the mosquitoes begin to sing, the people with their eyes closed listen carefully. They try to guess how many mosquitoes there are (auditive analysis). If there is no such game in the local culture, you may want to have everyone stand in a circle and hold hands. The group walks or skips around in a circle, still holding hands, while they sing a simple song. 1. Give everyone a sheet of paper with 5 dots on it. The dots should be spaced far apart. Everyone draws a circle AROUND each dot. Then they draw a second circle AROUND each dot in a different colour. Keep drawing new circles so that the dots become bigger and bigger around. 2. Have strips of paper long enough to fit around each person’s head. Everyone decorates their strip of paper (stickers, crayons, colored pencils . . .). Fasten the ends of the strip so that the strip fits AROUND the person’s head. 3. Choose an object that looks different on each side. For example, a box with something different drawn on each side. Everyone walks AROUND the box. They take a good look at the box. Then one person walks AROUND the box and describes what he sees (visual analysis, perspective). 1. Sit in a circle. Everyone is sitting IN BETWEEN two other people. Go around the circle and have each person name who they are sitting in between. 2. Put many small items on the floor. They are not in any particular order. Everyone takes a good look. Everybody takes a turn choosing one object and telling where it is: ‘It lies IN BETWEEN the (red can) and the (gray stone).” The others guess which object he had in mind. Anyone who knows, raises their hand. The leader calls on that person. If s/he guessed correctly it is her or his turn. Do make sure everyone gets a turn at describing an object. Also make sure the children learn to wait until they are called on to speak. 3. Put two cardboard boxes on top of each other. Put a piece of paper IN BETWEEN. How many pieces of paper fit IN BETWEEN? 4. Everybody gets a piece of paper with a few three-letter words written on it (consonant, vowel, consonant; English examples: cup, dog, cat). Talk about the words. Have everyone puts a circle around the letter IN BETWEEN. Now say the whole word. The participants say the vowel, the sound written IN BETWEEN. If appropriate, choose words in the mother tongue. 5. If no words in either the national or the mother tongue follow this sound pattern, use different sounds. For example, clap-stomp-clap. Have everyone do this together. Then ask them all to do the sound in the middle. Repeat with different combinations; possible sounds include: clap someone else’s hand, slap your own thighs or arms, tap the chair or the ground, snap fingers (tricky), hoot like an owl, whistle like a bird . . . .
A parent may also take a turn at leading. 6. Everyone gets a small piece of paper with a word written on it. Try to hold the piece of paper in a creative way IN BETWEEN fingers or hands (IN BETWEEN the wrists, the back of the hands, the fingers). Participants may take turns leading. One child or parent shows a creative way to hold the paper, and everyone else has to try to copy. This can get really crazy if the parent-and-child pair up and try to hold the paper in between themselves — in between their foreheads; in between their elbows; in between their shoulders. Scarves, other small pieces of cloth, or large leaves can also be used instead of pieces of paper. Closing: The leader names two participants. The person sitting IN BETWEEN those two can leave. Continue until everyone is outside. 1. Write the word on/to somewhere, clearly visible, in mother tongue. 2. Everyone gets a string (piece of yarn, ribbon . . .). They tie it to the leg of their chair. 3. Set out at least 4 things that have something attached to them (a bucket with a handle, a cup with an ear, a bicycle pump with a pipe, a pan with a handle, a comb with teeth . . .). Talk about the objects. Ask the participants describe each the object: What is it? What is attached to it. Have a parent explain this in the mother tongue. Then the parent holds up the things one at a time. Each time, the children describe the thing and what is attached to it in whatever language they use at home. The mothers listen and gently correct as needed. 4. Each set of parent-and-child gets a connecting toy to play with like Legos/Duplos; toy train; snap beads. Have a time limit on this play time. 5. Give each set of parent and child a length of string or safe, flexible wire (pipe cleaner). Have them make a new invention by finding two things (that don’t belong together) and attaching them to each other. Then have them take turns showing and describing their creations to the group. The crazier the better! 6. Needed: A straight strip of cardboard and a circle of cardboard (or paper) for everyone. Write a letter or number on the board which is made by attaching the circle to the strip (p, o, d, b, q, O). The participants copy the letter by putting down the strip and circle in the proper way. If the local/national language uses a script without these shapes, consider making musical notes. 7. Give everyone or every parent and child a piece of paper with many letters printed on it. The participants circle the words that are put together with a strip/line and a circle attached TO it. Adapt to the local script if it uses letters without these shapes. 8. Play “train.” One person is the engine. The “engineer” hooks different cars onto the engine. The engineer may ask each person what kind of car they are—passenger? Dining? Freight? or what kind of freight they carry—automobiles? Grain? Cattle? Each person hooks on to the car ahead of them by putting their hands on their shoulders or around their waist. When all of the cars have been hooked to the engine, the engineer blows a whistle and the “train” chugs around the room. “Engine” and “cars” may make appropriate train noises. 9. Each pair or set of parent and child ties themselves to each other at the ankle. Have short three-legged races. 10. Make a nice pendant for a necklace (use beads, nuts, any other art-and-craft). Or make a necklace/bracelet with things that are attached to each other—beads, hollow pasta, short lengths of plastic straws . . . . Or have the parents show the children how to braid three pieces of colored yarn, ribbon, cord. The children can tie the finished braid to their wrist or ankle. Closing: The participants take someone by the hand and walk outside hand in hand. *Walk TO something outside. Put your hand ON the shoulder of someone else. Walk outside. 1. Everyone shows how HIGH they can reach. 2. Play “I spy with my eye . . . something that is HIGH.” I see something HIGH. The person who guesses what you see can then take a turn seeing something HIGH up. (Make sure that there are items HIGH up). 3. When you stand on something you are HIGHER. Who can show that? When somebody sits on your shoulders that person is HIGHER. Who can show that? 4. Pantomime doing things HIGH up. Examples might be window washing, picking cherries, roofer, maintenance of streetlights, pruning trees, putting up decorations, paste advertisements on billboards, climbing a ladder, etc. 5. Rhymes. Name 3 words that rhyme. Who can think of a word that rhymes with . . .? Start with the word for HIGH or for something that is HIGH. 6. Draw something that is HIGH (airplane, sun, moon and stars, birds, clouds). 7. Have everyone cut out a nice shape or make a drawing on a circle of paper. Attach a string to each piece of art and hang them up HIGH in the classroom. 8. Make HIGHER-UP toys (stilts) for each child. Needed: two tin cans of the same size for each child (or 2 blocks of wood or 2 very strong plastic containers); strong cord or rope; a hammer and large nail to punch two holes into each tin can; markers or paper & glue for decoration, if desired (see https://babbledabbledo.com/tin-can-stilts/ for example). Children practice walking HIGH. 9. Tell a story which includes HIGH activities. Participants act out the HIGH activities as the story is being told. Example: Joe had to bring a message to his father. First Joe had to climb a high mountain, up, up, up, higher, higher, higher, above the clouds. Then he had to jump high over a deep ditch/river. Next he had to take a trip high up in an airplane. Where was his father? He heard his father calling to him, from way up high. Joe shaded his eyes with his hand while he looked up high. He looked all around. Finally, he found his father sitting in a tree (on top of a building). He had to climb a ladder (climb the tree), higher and higher, to get to his father. Whew! He was glad he could finally lay down! Have a parent retell the story in whatever language the parent chooses. Everyone repeats the activities. Closing: Everyone picks up his or her ‘pretend ladder’ and takes it with them while going outside. OR, if the children made stilts, they use these to walk outside. 1. Have everyone try to TOUCH the tip of their nose with their index finger. Then try to do this with eyes closed. 2. The leader calls out part of the body. Everybody TOUCHES that part of their own body. Begin with easy (hand, ear) and increase the difficulty both in reaching and in vocabulary (heel, collar bone, shoulder blade). When the group knows the game one of the mothers can lead; she calls a body part in the mother tongue. Make it a competition: call out the words faster; who are the ones that keep TOUCHING the body parts correctly? 3. If it is inappropriate to touch body parts, play the game with some other object—like the parts of a chair (leg, seat, back), parts of clothes (sleeves, button, pocket), or something else with several parts (trees?). OR call out colors. When the leader says, “Touch green,” everyone must touch something green. “Touch blue; touch black; etc.” Parents can take turns being the leaders. They may lead the game in whatever language they choose. 1. Ballgame (perhaps do this outdoors). Make a goal (basket, rug on the ground, cardboard box). One by one the participants try to TOUCH/ hit the goal by throwing a ball, a beanbag, or a Frisbee-like item (paper plate). 2. Everyone gets a piece of paper. Draw circles on a paper. Exchange papers with someone next to you. The next person tries to put a dot right in the middle of the circle. Together, make a flower out of the circle. 3. Good touch/bad touch. Show the outline of a human being or hold up a doll. Discuss what parts of a child are okay to touch and what parts are not. For example, in America it is okay for a stranger to shake someone’s hand, but it is not okay for them to touch someone’s knees. However, a doctor may touch someone’s knees to examine them. What parts are almost never okay to touch? What should you do if someone tries to touch you that way? You may wish to give each parent a piece of paper with the outline of a human form on it. Together the parent and child might circle the parts that are okay to touch. Or they may color the parts that are not okay to touch one color and the parts that are okay another. Closing: Tag. One person is “it.” They try to TOUCH someone with their hand. Whoever is touched is ‘OUT’ and goes outside. 1. Secretly write a letter on a piece of paper. Begin the game by stepping on the paper. Say, “UNDER my foot is a (red) piece of paper. It has a letter written on it.” Name a number of objects that begin with the same sound as the letter. Everyone guesses which letter it is. 2. Give everybody a piece of paper with a letter written on it. Make sure that everybody knows which letter he/she has, and which words begin with that letter too. Try to do this exercise in the mother tongue too. Everyone takes a turn at being the leader. This can also be played more actively. If someone says, “My hand is UNDER my chin,” everyone must put their hands under their chins. Or people can take turns being the leader. The others in the group watch carefully. Is what the leader says true? Are the leader’s eyes really UNDER their mouth? Is the leader’s right hand really UNDER their left elbow? 4. Place it under. Give everyone a coloring sheet with a pond or lake drawn on it and another sheet with fish, a boat, ducks, etc., drawn on it. Have them cut out these things and glue them on the first one. First discuss–Is the boat UNDER the water or is the water UNDER the boat? OR give everyone a sheet of paper. Have them draw a pond on it. Then have them draw at least two things that are UNDER water and two things that are ABOVE water. 5. Give everyone a sheet of paper with two boxes on it, one above the other. Have everyone draw an object in the top box. Exchange papers. Have everyone name the object in their top box. Then have them draw something in the bottom box that rhymes with the item above. 6. Tell the story of a seed. Everyone receives a small box with soil in it and a seed to plant UNDER the soil. Take care of it. OR give everyone a bit of paper with printing on it; it does not all have to be the same (newspaper, advertisement, paper menu . . .). Have the children draw a colored circle at least 4 letters that go UNDER the line of printing. See if they can find even more than 4. Closing: Place a table in front of the door. Everyone who wants to may go outside by creeping UNDER the table first and then going on through the door. OR have two tall children/parents hold hands to make an arch over the door. Everyone walks outside UNDER the arch. 1. The leader puts on a hat that does not match who he/she is. If the leader is a woman, she might put on a man’s hat. Now she LOOKS LIKE a man, but she isn’t. (Or a fireman’s helmet or a chef’s apron or . . . Now he LOOKS LIKE a fireman, but he isn’t.) Have a box with lots of different things in it. The participants take turns choosing something out of the box. They mimic using the item or being the person who would wear the item. The others name the item and guess who the person LOOKS LIKE. Possible items: toy microphone, farm or gardening tool, laundry things, cooking things, tool for building, car key, different hats. 2. Sounds alike. The participants are divided into two groups. Turn by turn someone stands in front. He says a word loudly and clearly. The next person says a word that sounds LIKE the first one, but which is slightly different, a rhyming word. He walks to the front and says it loudly and clearly. Which group can keep doing it the longest? 3. Looks alike? Someone sits/stands in a particular position. E.g. Arms up and mouth open or sits on chair with legs stretched straight forwards. Someone else copies this, but makes a slight difference: arms up and mouth closed, or sits on chair with legs stretched straight forwards but also and pulls his own ear. The one who sees the difference first can have the next turn. 5. Worksheet with two drawings on it that seem the same but have 5-10 differences. Give everyone a copy. Have them circle the 10 differences. 6. Every small group gets a pile of small papers. They have different shapes and colours. The group sorts them in colour and shape into piles that are ALIKE. They look ALIKE but they are not (circles, ovals; rectangles, squares; triangles, right angled triangles; red/ orange; light-blue/dark-blue). Discuss the differences. Closing: Sing two songs that sound ALIKE. Everyone walks outside to the beat of the last song. 2. The group is divided in pairs. One person stands behind the other. The person behind follows exactly the STEPS of the person in front. Be careful with your friend! 3. Two people have four legs. Again, divide into pairs. The person behind holds on to the middle of the friend in front. This time the pairs step (walk, hop, run) together a horse. 4. Make steps. Dip the tips of your index and middle finger in the paint. Rub them over a long piece of paper. You leave a trace. Someone else does the same with another colour and leaves another trace. Draw now where the traces are leading to. 5. Give everyone the letters of the word STEP. People put the letters in the right order. 6. Give everyone a piece of paper with one set of footprints on it. Prepare the papers ahead of time. Use several different kinds of footprints–little children’s bare feet, muddy male boots, delicate lady’s slippers, etc.). Have the people their picture by drawing a person that goes with the footprints. Have the group talk about what sort of person goes with what sort of footprint. Closing: Sing a song and step to the beat. (A drummer beats the beat on a drum). After a little practice we STEP to the beat outside.